One morning the Fianna were deer hunting on the shores of Lough LÃ©in in County Kerry. They saw a beautiful white horse coming towards them. Riding on the horse was the most beautiful woman they had ever seen. She wore a long dress as blue as the summer sky and studded with silver stars. Her long golden hair hung to her waist. "What's your name and what land have you come from?" asked Fionn, leader of the Fianna. "I am Niamh Cinn Ãir (Niamh of the Golden Hair). My father is king of TÃ­r-na-nÃg," she replied. "I have heard of a warrior named OisÃ­n, of his courage and of his poetry. I have come to find him and take him back with me to TÃ­r na nÃg." "Tell me," OisÃ­n said, "what sort of land is TÃ­r na nÃg?" "TÃ­r na nÃg is the land of youth," replied Niamh. "It is a happy place, with no pain or sorrow. Any wish you make comes true and no one grows old there. If you come with me you will find all this is true." OisÃ­n mounted the white horse and said goodbye to his father and friends. He promised he would return soon. The horse galloped off over the water, moving as swiftly as a shadow. The king and queen of TÃ­r na-nÃg welcomed OisÃ­n and held a great feast in his honor. It was indeed a wonderful land, just as Niamh had said. He hunted and feasted and at night he told stories of Fionn and the Fianna and of their lives in Ireland. OisÃ­n had never felt so happy as he did with Niamh and before long they were married. Time passed quickly and although he was very happy OisÃ­n began to think of returning home for a visit. Niamh didn't want him to go but at last she said, "Take my white horse. It will carry you safely to Ireland and back. Whatever happens you must not get off the horse and touch the soil of Ireland. If you do you will never return to me or to TÃ­r na nÃg." Ireland seemed a very strange place to OisÃ­n when he returned. There seemed to be no trace of his father or the rest of the Fianna. The people he saw seemed small and weak to him. 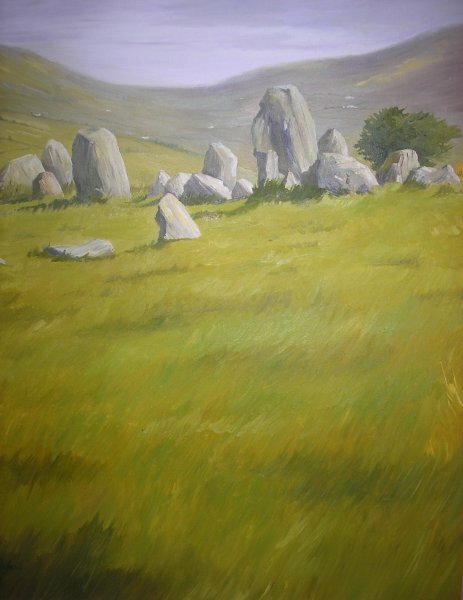 As he passed through Gleann-na-SmÃ³l he saw men trying to move a large stone. "I will help you," said OisÃ­n. The men were terrified of this giant on a white horse. Stooping from his saddle OisÃ­n lifted the stone with one hand and hurled it. Just then, the saddle girth broke and OisÃ­n was flung to the ground. Immediately the white horse disappeared and the men saw before them an old, old man. So they brought him to Patrick, and to Patrick he told the story of all that had befallen him. But Patrick made his scribes write all carefully down, that the memory of the heroes whom OisÃ­n had known, and of the joyous and free life they had led in the woods and glens and wild places of Erinn, should never be forgotten among men. And OisÃ­n, during the short span of life that yet remained to him, told to Patrick many tales of the Fianna and their deeds, but spoke little of the three hundred years that he had spent with Niamh in the Land of Youth. OisÃ­n's Grave, (2nd turning left off the Main Cushendall/Ballymoney Road), is a megalithic court cairn (4000 BC) on a hillside in the townland of Lubitavish (LÃºb an tSÃ¡mhais) on the Tievebulliagh (Taobh Builleach) Mountain, near the Glenann River.